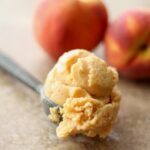 This frozen yogurt makes the most of the late summer peaches while still keeping it cool for those of us with temperatures lingering in the triple digits. I enjoyed the rich fruity creaminess of this frozen yogurt. 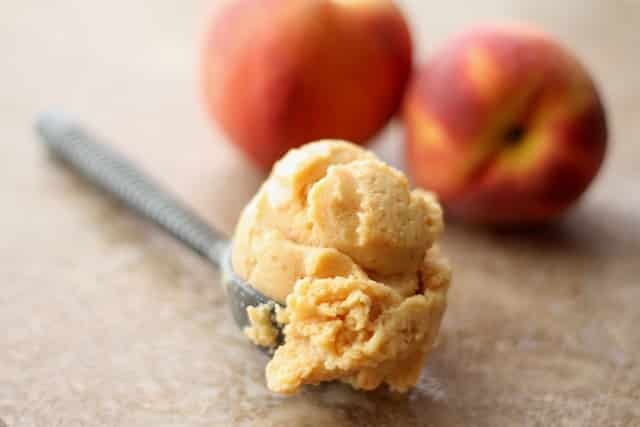 The peaches really shine after a quick roasting in the oven and the yogurt provides the tanginess that I’m beginning to love in these frozen yogurts. Roasting will improve most stone fruits, even the sub par ones that show up occasionally. There is something almost magical about the way that brings out additional flavor. Sweeten this as much or as little as you like, according to the sweetness of your peaches. Add a small amount of sugar, then blend and taste before adding additional sugar. Preheat oven to 425 degrees. Split the peaches in half and remove the pits. Place the peach halves, cut side up in a baking dish. Drizzle generously with honey. Roast for 15-20 minutes, until very tender. Remove from the oven and place in the blender. If there are juices in the pan, add them to the blender as well. Blend the peaches until smooth. Add the remaining ingredients and blend until combined. Transfer to an airtight container and chill in the refrigerator until cold, preferably overnight. Once cold, pour into the ice cream machine and freeze according to manufacturer's directions. Serve immediately for soft-serve ice cream or transfer to an airtight container and freeze for a firmer frozen yogurt. Enjoy! Didn't think of roasting the fruit, love the colour of this yogurt. This looks so beautiful I can't stand it, what a color! You are surely the queen of frozen desserts. You had me at honey roasted peach. That sounds incredible and this version in frozen yogurt is gorgeous. I love the idea of roasting fruit for sorbet. Or any dessert for that matter! I Made This Today And My Family Loved It! I Love That It Is Such An Easy Recipe. I'm diabetic so I used Truvia instead of sugar. it was sinfully good! I felt like cheated on my diet lol.